Children Again Pay The Price in Yemen's War As Focus Shifts To Accountability The United Nations says 22 children were killed in an airstrike and puts the blame on the Saudi-led forces intervening in the civil war. 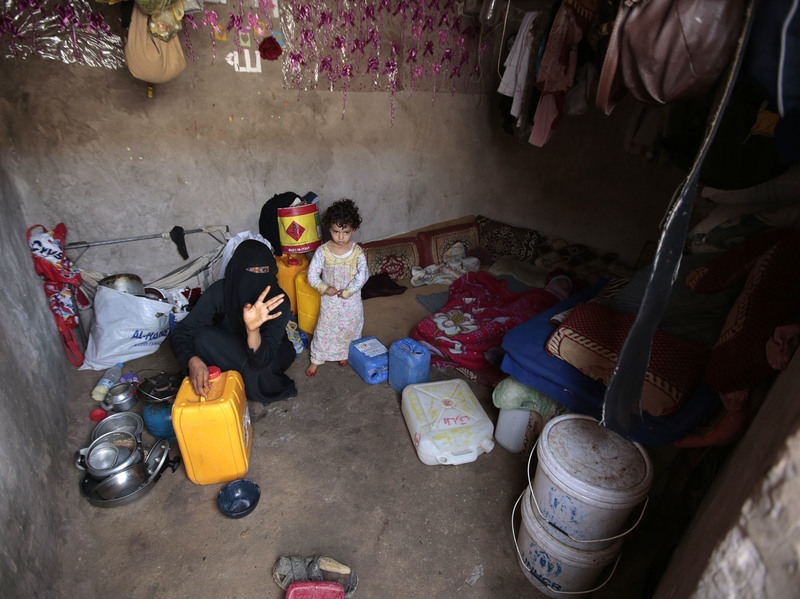 A Yemeni woman and a girl, displaced from the coastal city of Hodeidah, sit at a shelter in Sanaa, Yemen, on Aug. 17. Thursday's airstrike took place near Hodeidah. "This is the second time in two weeks that an airstrike by the Saudi-led Coalition has resulted in dozens of civilian casualties," said Mark Lowcock, U.N. undersecretary general for humanitarian affairs. On Aug. 9, U.N. Secretary General Antonio Guterres blamed the Saudi-led coalition for an airstrike that hit a school bus killing at least 50 people. The two statements — both unusually strong for the U.N. — highlight the growing concern over what appear to be especially indiscriminate attacks in a war already marked by high civilian casualties. U.N. 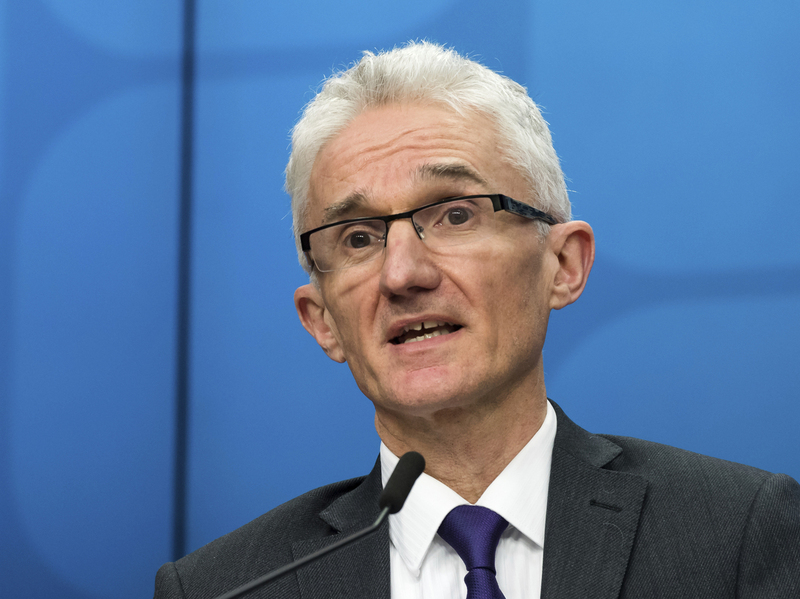 Undersecretary General for Humanitarian Affairs Mark Lowcock blamed the Saudi-led coalition for carrying out airstrikes against civilians in Yemen. "This is the second time in two weeks that an airstrike by the Saudi-led Coalition has resulted in dozens of civilian casualties," Lowcock said. Members of the U.S. Congress and human rights advocates have objected to U.S. support for the Saudi-led coalition, which includes targeting information, weapons sales and mid-air refueling of planes. CNN reported that the bomb that hit the school bus was U.S.-made. The U.N. said earlier this month that it had documented 6,592 civilians killed since the coalition entered the war in 2015 — saying coalition attacks account for most of them. The war has also led to food shortages and the spread of disease. There were conflicting reports about Thursday's strike. The Associated Press reported Houthi sources saying an attack in the ad-Durayhimi district near the port city of Hodeidah killed 30 people. The AP said that there were also accounts saying just nine were killed. The state news service for the UAE — a member of the Saudi-led coalition — reported that the Houthis fired a missile at a village in the area that killed one child and injured dozens of other people. It was unclear if this referred to the same incident the Houthis blamed on the coalition. The statement by the U.N.'s Lowcock, blaming the coalition, came out after those reports. The report said the countries supporting the coalition need to press for better accountability. "Those countries that continue to sell weapons to Saudi Arabia — including the U.S., U.K. and France — risk complicity in future unlawful attacks, particularly given that coalition assurances to take action have proven hollow," it stated.